It could have been worse. I could have broken my right arm in three places (I’m right handed), rather than the left. I could have knocked my teeth out or broken my jaw when I landed face down in the street, yet somehow I managed to keep my badly scraped up face intact. I was very lucky that my shoulder stayed in place and will not require surgery and that I should regain full use of my arm, even though it will take at least 6 months. There have been some important lessons learned during this ordeal. I am one of those people who are busy, busy, busy, no matter what. When I am not trying to juggle doing several things at once, I’m preoccupied with what’s next. I never seem to be able to “stop and smell the roses” and quite honestly, I think I’m beginning to understand that is no way to live my life. A month ago when I fell while walking the dog, I was totally preoccupied with worrying about something I shouldn’t have been concerned about and wondering how I was going to be able to squeeze one more “to do” into an already packed schedule. My accident has forced me to finally slow down. It’s a little difficult to rush through life with only one functioning arm, and it’s given me the opportunity to really think about what I want out of life. I still don’t have all the answers, but I’ve been able to narrow it down a bit. It’s time to ease back on the throttle and focus on the things I really enjoy, like this blog, and accept that other things might have to fall by the wayside. Speaking of this blog, I was just dying to pick up my camera again and get back to it; hence this post. But, I had to question my sanity as I was crawling around on the dining room floor trying to get the perfect shot while using my tripod as a second arm. Maybe I should continue slowing down, i.e., resting and healing a little longer? Slowing down while healing also meant turning over the kitchen duties to my husband, who has done a wonderful job of keeping food on the table. I’m back in the kitchen now, albeit one-handed, and the food I’m able to cook is limited, which might not be a bad thing. Simple dishes that let the ingredients speak for themselves sound really good to me right now. During the summer I am always more inclined to simplify my cooking anyway. There is so much great produce out there. This year we joined a CSA for the first time. The season just started, and the jury is still out – garlic scapes and kohlrabi anyone? But this week we did receive a huge bundle of basil in our weekly selection. I was originally just going to make a Caprese salad but decided to go one step further by making a Pistou to drizzle over sliced tomatoes and fresh mozzarella. Provençal Pistou is very similar to its Italian cousin, Pesto, with the difference that Pistou does not contain pine nuts. I was looking for a more pure basil flavor for this sauce. 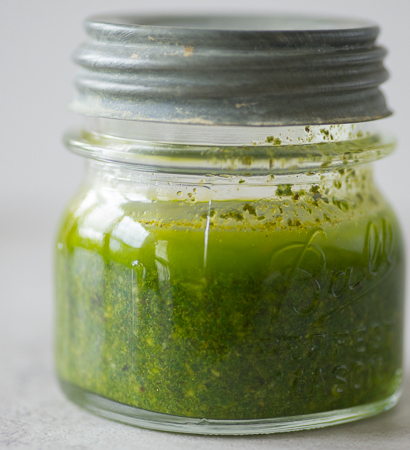 Pistou is one of those sauces that have so much versatility. Try it stirred into vegetable or legume soups or over any kind of grilled meat or fish. 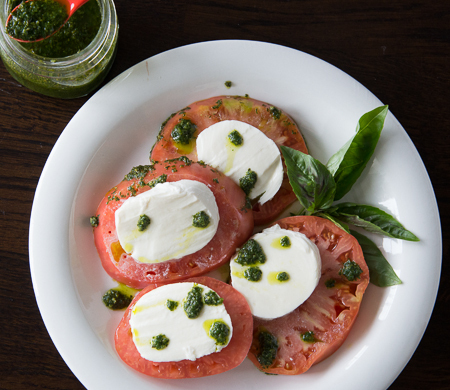 The number of servings for this salad can vary depending on how many tomatoes and how much mozzarella you have on hand. The recipe makes enough Pistou to double the amount of servings. I used two really large heirloom tomatoes for four servings, which would also equate to two nice lunch servings. Make the Pistou. Peel and halve the garlic clove length wise and remove the germ in the center of the clove. Note: This isn’t so important when you are cooking garlic, but the germ can be somewhat bitter when garlic is not cooked. 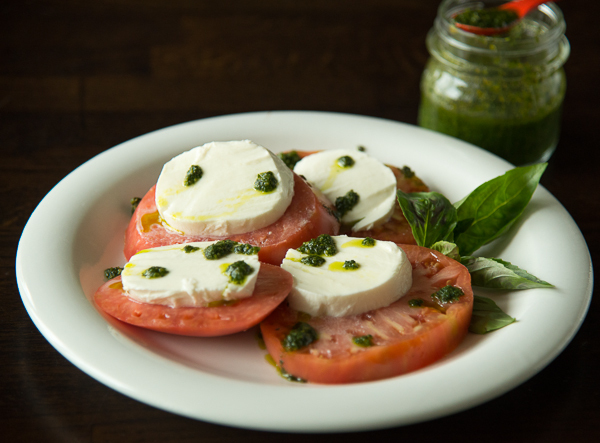 Place the garlic, basil, and Parmesan in the mini-bowl of a food processor. Pulse until the ingredients are finely chopped. With the machine running, add the olive oil in a steady stream. Add salt and pepper to taste and pulse to blend. Assemble the salad. Slice the tomatoes and the mozzarella. I like slices that are a little under half an inch, but not as thin as a quarter of an inch. 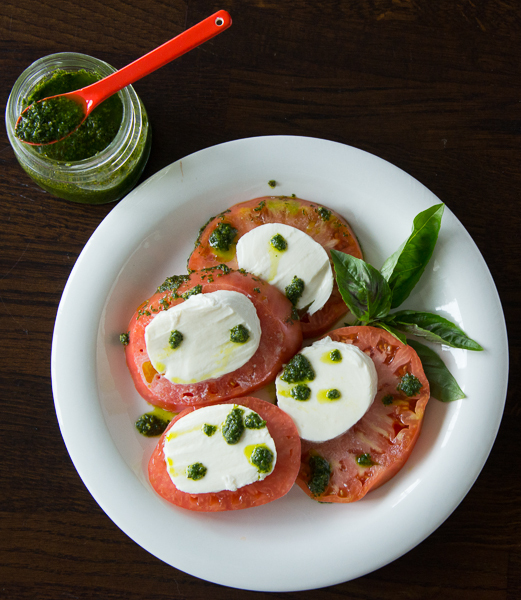 Arrange the tomato slices on individual plates or a serving platter. 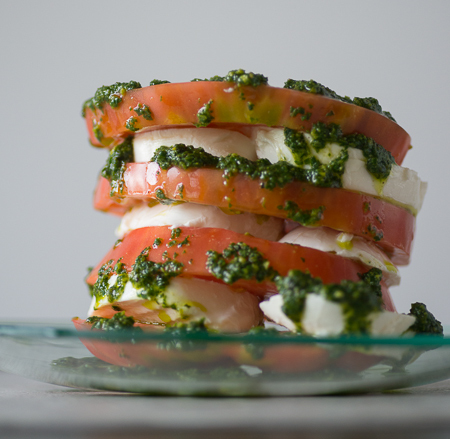 Top each tomato slice with a slice of mozzarella. Drizzle with the Pistou and serve.